If you're a regular around these parts you know that I'm not a particular fan of poetry. I try to like it, but in general I just don't get it. I like plain speech. But I can handle rhyming in Children's Picture Book form (for the most part - and most especially when it comes from the pen of Bill Peet.) Every April I feel guilted in to reading some poetry and so I give it another go. Just because I don't necessarily go for it, doesn't mean that I should deny my children the experience, correct? Enter: Candlewick Press. They asked if I'd like to take a peek at some of their picture books and I agreed to do so. These are the ones I chose to read through with my kids. 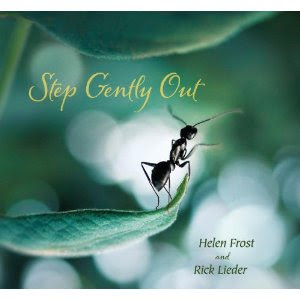 We began by reading Step Gently Out , by Helen Frost. Bookworm1 was snickering at the cover because he knows I don't like bugs. In his mind, this book promised to be awesome. Of course, I obliged him by making disgusted faces when having to stare at the insects at my fingertips. Now, I'm not into poetry and therefore I am not really fit to critique it. This book flowed together very loosely, containing only one line of text per page spread. The idea of Step Gently Out is to cause the reader to be aware of the little creatures that exist in the outdoors. Step outside and enter into the magical world of . . . bugs. "An ant climbs up to look around. Each line is accompanied by a picture of something with beady little eyes. I jest (sort of) but I will say in all honesty that the photography by Rick Lieder suits the text beautifully. Outside Your Window : A First Book of Nature, by Nicola Davies was the one I was most looking forward to reading through and is my particular favorite. The illustrations by Mark Hearld draw me in. Each page spread is a collage, piecing together the scene which illustrates the individual poems contained in this book. Again, I'm not a poetry critic but the only poetry I ever seem to be able to stomach (and moderately enjoy) is poetry about the great outdoors. 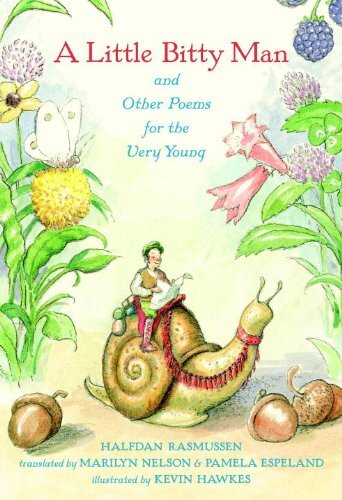 The poems in this book are simple and sweet and therefore easy for children to sit through in brief chunks of time. (There are 102 pages of verses inside so this isn't exactly something that is intended to be devoured in one sitting.) There are poems about the seasons, the wind, the seashore, a starry sky, a spider's web, chickens, acorns, lizards and worms. Reading these verses makes you want to go out and take a long walk through a magical wood. My favorite poem in this book is called Night. "The moon sails white and silver in the dark sky. sometimes you can feel the world is turning." Bookworm1's thoughts: Not very appealing. (We only got a few poems in before he became distracted. I ended up looking at this book all by my lonesome, to tell you the truth. But I enjoyed it! and potties to poop on!" I hardly need to say more. This book is full of silly little rhymes that may have made a grown woman snicker but the young boys laugh hysterically. Bookworm1's thoughts: "So, so funny!" Now comes the nice part you've been waiting for . . .
Candlewick Press has offered to give away one of the above titles of your choosing to one of you. 2. Which title you would like to win, should your name be selected as the winner. This contest is open to U.S. Residents only and will be open through Thursday, April 26th. Thank you, Candlewick Press, for continue to expose myself and my children to bits of poetry and for offering another individual the chance to do the same! I've gotta go with the Little Bitty Man (or whatever it's called) for the humor factor. It's a great way to win children (& adults!) over to poetry! I would love to read Outside Your Window to my nearly two-year old twin grandchildren. My experience, both as a child who enjoyed poetry, and a father with kids, is that children seem to prefer poetry with a regular meter and rhyme. In other words, the opposite of most modern poetry directed at children. Thus, Tennyson has been a hit with my kids, and some Shakespeare, for the same reason. Swifter than the moone’s sphere;"
The rhythm is the thing. For my part, I loved Rossetti, Dickinson, and Frost when I was a kid. Somehow I think The New Kid on the Block would be more Bookworm's style. I think we'd like the little birth man. I love Bill Peet too! For a while I had this idea of writing historical poetry for children and when I read about stuff like this I think, "maybe that wasn't such a bad idea after all." I'm glad you're reading this to your kiddos, even though you aren't a fan. Most people who appreciate poetry say it's because their parents used to read it to them. I know that's true for me. I guess it's true for most reading in general. Outside the window looks lovely!! As tempting as the other ones are for me, I'd have to pick "Step Gently Out", since Grasshopper loves bugs so much. 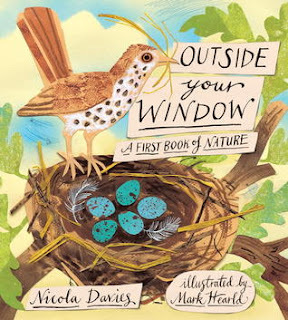 Picking Step Gently Out... Must admit the cover to Outside Your Window most appealing!! Ourside Your Window looks wonderful! My favorite book as a child was "A Child's Garden of Verses," so I'm really excited about this giveaway. I'd really love to give "Outside Your Window," to my 3-year-old godson. All of these books look cute, btw. We aren't big into poetry either.